Thursday night in Chicago, the Blackhawks defense was a brick wall and Cristobal Huet earned a shutout over the Columbus Blue Jackets. Saturday afternoon, the same two teams played in Ohio, and the results were dramatically different. It took six Blackhawks goals, three of which came in a furious third period, to earn a hard-fought 6-5 victory in Columbus in a game that saw Huet lose his cool, but not the game. The Hawks again scored early, taking less than three minutes to put the first point on the board. Andrew Ladd took a soft rebound from Steve Mason and banked it into the net from a tight angle to put the Hawks up 1-0. Five minutes later, Troy Brouwer took an exquisite pass through two defenders from Patrick Kane and scored into an almost wide-open net to make the lead two. That advantage was short-lived, though. At 11:44 into the first, Kristian Huselius beat Huet to make the lead 2-1. This would start a trend that carried through all three periods, as Huet struggled to move side-to-side and left his top shelf open most of the afternoon. Thankfully, the Blackhawks offense stormed back, with Marian Hossa putting a long rebound back over Mason only 24 seconds later to extend to a 3-1 lead. It looked like the Hawks were going to put Mason in the shower early. But just before the end of the first period, Columbus superstar Rick Nash stole the momentum back to the Jackets’ end of the ice with goal to cut the lead to one after one. The momentum would carry over to the second, where the Jackets would outskate and outshoot the Hawks. It took the Jackets only 12 shots to score twice in the second, both coming in the first eight minutes of the period, and the Hawks were clearly on their heels. After the fourth goal, the second for Nash, Huet worked out his frustration at the expense of his stick on the goal post. The once-dominating Blackhawks went to the second intermission trailing 4-3, and their confidence was shaky at best. Leaders lead, especially when the going gets tough. 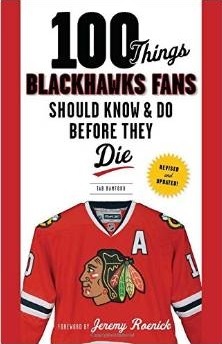 Thankfully for the Blackhawks, Jonathan Toews is a great leader. At 4:07 into the third, on the power play, Toews connected after pretty passes from Brian Campbell and Kane to tie the game. 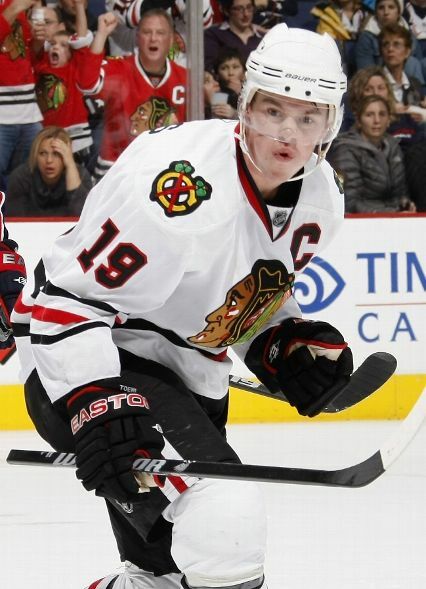 The Hawks appeared to be more focused on the bench, and intent on getting two points to start their long road trip. A little over four minutes later, Ben Eager took a great pass out of the crease from Colin Fraser and gave the Hawks the lead for the first time in over 20 game minutes, and the momentum appeared to be shifting back onto the visiting bench. When Toews deposited his second power play goal of the period, the Blackhawks that lit the lamp in the first period appeared to be back. Huet wouldn’t let the Hawks off the hook, though. Less than three minutes after Toews’ second goal, Raffi Torres beat Huet to make the score 6-5, and the game was again in question. It took a great effort from the Hawks defense, including a number of great blocks from Niklas Hjalmarsson, to keep the lead for the Hawks in a late push from the Jackets, and Huet escaped with a win he didn’t deserve. Brouwer, Hossa and Ladd each had a goal and an assist, and Toews led the team with two goals and an assist in a balanced attack for Chicago. Kane had three assists and Patrick Sharp added two as the Hawks offense was effective from three of the four lines. Unfortunately for the Blackhawks, Kris Versteeg’s nine-game point streak ended. On Sunday, after a hard-hitting game on Saturday, the Blackhawks will again be tested by a Detroit team that’s starting to get their superstars back. Antti Niemi is expected to be in goal, which will bring welcome rest for Huet. Niemi shut out the Red Wings in December, and Huet will likely want to give himself some time to get Saturday out of his system before taking the ice again.